Donny Schatz, the three-time and defending World of Outlaws champion, won his fourth consecutive Knoxville Nationals on Sunday night. Schatz passed Joey Saldana on the 35th lap of the 40-lap contest as the pair of World of Outlaws stars wound up finishing one-two. Schatz now joins 20-time World of Outlaws champion Steve Kinser as the only two drivers in the 49-year history of the event to win four in a row. Schatz began the week by posting the third-fastest lap in time trials on the opening night of the event and charged all the way from 21st to finish seventh that night on a track that was very fast and tough to pass on, to earn the most points of the first night qualifiers. A strong run in the A-Scramble on Friday night would place him sixth on the grid for the finale which was pushed back one night by rain. 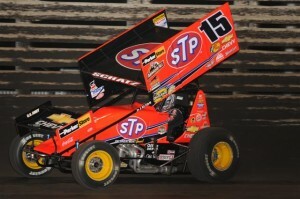 Schatz won earlier this season in World of Outlaws action at Knoxville. Saldana finished second for the second time in the last three year. The native of Brownsburg, Indiana, who has won 13 times this season with the World of Outlaws started on the outside of the front row on Sunday night and led the first 34 laps. Kraig Kinser finished sixth on Sunday night after a very strong runner-up performance in the Thursday night qualifier. Craig Dollansky worked his way from the 18th starting spot to finish ninth. The native of Elk River, Minnesota was running third on Wednesday night in the qualifier when he was caught up in someone else’s accident and rallied back from that to continue his strong second half of the season. Jac Haudenschild won the B-Main on Sunday night to race his way into the A-Feature and charged all the way from the 21st starting spot to finish 10th. Danny Lasoski, the 2001 World of Outlaws champion, came home 11th on Sunday night after coming all the way from 17th in the B-Main to third to earn a spot in the main event. Steve Kinser wound up 12th, after charging all the way from the 20th starting spot to eighth in the first five laps of the race. Lucas Wolfe, the reigning Kevin Gobrecht Rookie of the Year with the World of Outlaws wound up 18th. Jason Meyers, who came from 11th to second in the B-Main, suffered a couple of flat tires which ended his night early on. Jason Sides, who is currently fifth in the World of Outlaws championship standings, had engine trouble during his qualifying run on the opening night which set him back for the rest of the event. He would eventually wind up in the C-Main on Saturday night. Brian Ellenberger, the current rookie leader also had some tough luck as well with his weekend ending in the E-Main. The 2009 Gold Rush Tour kicks off for the World of Outlaws on Wednesday, August 19 at Deer Creek Speedway in Minnesota for the inaugural Sprint for a Cure Summer Clash. The Gold Cup Tour will encompass 12 nights of racing at eight tracks in five states and one Canadian province.